Dublin is one hell of an expensive city. After wandering around it for 2 days, my pockets were bare, but so was my stomach and it needed to be filled. One of the many reccommendations I received was to try out Green 19. Coined as "recession chic", Green 19 serves straightforward pub grub with strong Irish influences in a rather "too cool for school" bar/cafe setting. On arrival, I'm not sure why I was surprised to see the rather young queue forming outside at about half seven on a Wednesday evening. We struggled to the front to put our names on the waiting list and were told tentatively that a table might be free in about an hour. So we set out to discover a few bars in the local area one of which was Anseo. This pub, situated just next door, has been standing here for many years under many different guises. It was so dark and dingy inside that on a couple of occasions, as I reached for my Guinness, all I managed to grasp was a fistful of air. It had managed to blend itself perfectly into its environment. After an hour and a half, we made our way back to Green 19 and our table was ready. 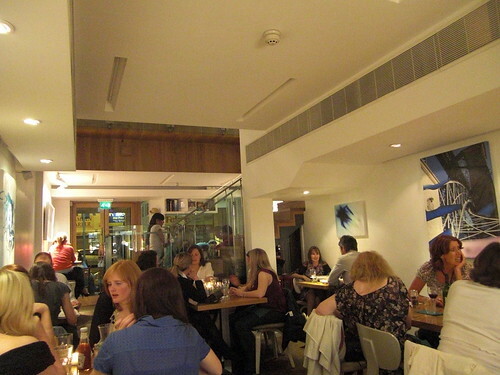 As always, I had a bit of a chat to the waitress and she explained to us how lucky we were to get a table. Since they had opened, they had been inundated with customers and now had a two week waiting list to get a table. Looking at the menu, I could see why. The prices were cheap in London terms, an absolute steal in Dublin terms, nothing was over 10€. I asked what the waitress what I should order, and without hesitation, she told me the corned beef. My immediate reaction to corned beef are memories of sitting by a campfire when I was 12. There I would be simmering a tin of corned beef and some onions over the fire, and then finishing it off with a tin of beans. Well, this certainly wasn't anything like that! 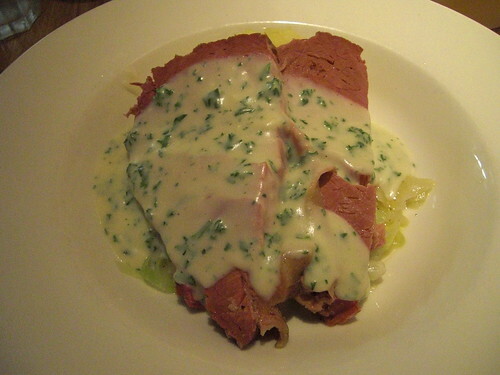 Two slabs of beautifully cured beef slathered in glorious parsley sauce. The beef was so tender that even a sniff of my fork was enough to flake off the delicate meat. Accompanied by the two traditional staples of cabbage and potatoes, this was Ireland in a slightly bowl shaped plate. Wonderful. Simple but nice. Didn't really get a chance to get much of this, my cousin snarfed it all before I had a chance. The little bit I did get was still tender, sauce was good if a little thin. In my humble opinion, it is pretty hard to fault Green 19. 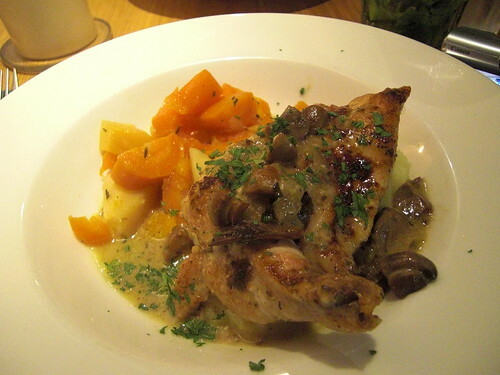 The food they are churning out of their kitchen is top notch and highly affordable. It is no surprise that this little restaurant has become so popular in such a short space of time, and I would highly reccommend a visit if you are ever in the neighbourhood. Just remember to book!